Plants have to be, by far, one of the best ways to liven up any home, both inside and out! One of the biggest, and most important, reasons is that they are natural air purifiers. They’re also great for decorating. In fact, you can learn how to create a special space for your plants where you can present them in creative ways that complement your decor. Try one of these five easy ways to showcase houseplants in a way that visitors to your home will not soon forget! If you have a love for hanging plants, such as pothos or spider plants, simply placing them into one of those old-style bird cages can make them even better, creating a unique and different presentation. These are ideal for hanging plants, as they are already designed to hang, and the vines can easily grow through the sides, allowing them to drape beautifully! Everybody loves a good fairy garden, don’t they?? But, fairy gardens are not just for your yard or porch; you can create one inside your home, as well! It is actually simple to create a fairy container garden and it’s even more fun when you use a larger, vertical growing plant, such as an indoor palm tree for your fairy garden. The base of the tree turns into the perfect spot for a tiny fairy bench, house or swing! Not only can you make a watering can into a planter, but you can also simply use it as a vase! There are so many different colors and styles of watering cans to choose from that you can perfectly match almost any decor you desire. You can get even more creative and hang a watering can planter by its handle if you so choose! There are literally endless ideas for vertical and wall gardens, and so many of them are markedly inexpensive! 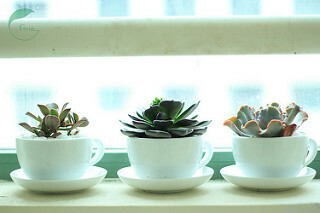 Not only are many of these ideas easy on your pocketbook, but they are also ideal for folks who do not have a lot of space for indoor plants. Shanty 2 Chic’s $10 Ladder Planter is an awesome example, but you can use just about anything from shelves to shower curtain rods to jazz those up bare wall spaces with plants! This idea is one that could easily become a fab fave! Teacups of any size or color will do, and they can be beautifully displayed as a centerpiece on any kitchen counter, or even your coffee or end table! Get really fancy and line up these sun-loving varieties on your windowsill! As you can see, with a little creativity, you can use just about anything to showcase your houseplants in an unforgettable way. It is possible that right now, you likely have all — or at least most — of the materials you’ll need to create at least one of these awesome ideas!